Fence and gates always fascinate me and I wanted to make separate posts on them in order to exhibit my photos related to same, so joined “Run a Round Ranch” for Good Fence meme for first time. 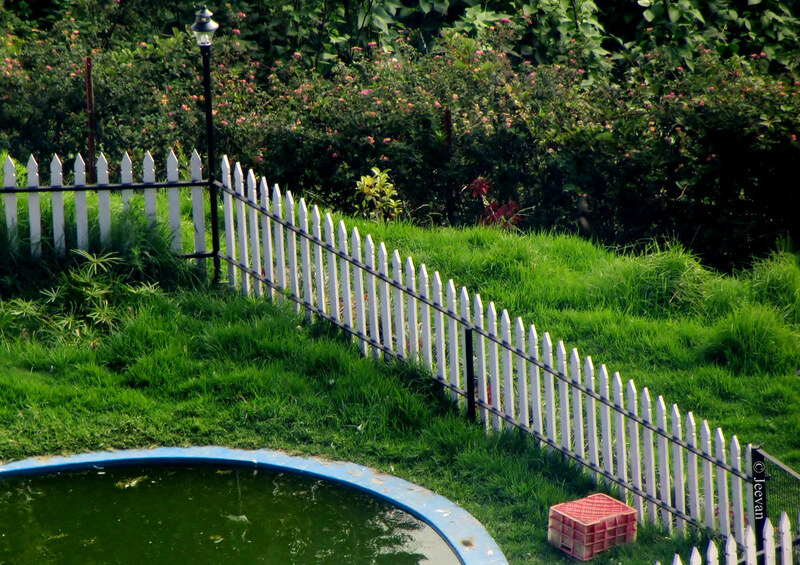 Following is a neat fence that encloses a little pool belonged to some cottages in Kodaikanal that I shot from the cottage we stayed above. I think the entire setting is built to attract visitors’ esp. children but what interest to shoot these pictures was the white picket fence. Among the different kind of fences, the white picket fence with sharp edges has been my favourite always. The white fence lay around the green lawn does look pretty always and in the picture above there is another fence line (you could notice) goes aside the ramp leading into the cottage. Apart the fences, I observed few more things that lay around (a small yellow pedal boat, a terracotta horse and cute cross bridge) were also attractive. Like I said in my previous post, Deepavali is not only about firecrackers sweets and snacks are part and special ingredient of the festival of lights. Every year we prepare sweets and snacks at home and distribute it to relatives and friends as a source of sharing our festival zest. Usually the sweet and snack we prepare at home was the traditional items of "Athirasam and Murukku", though both are made of rice flour Athirasam has melted Jaggery and patted rondure. 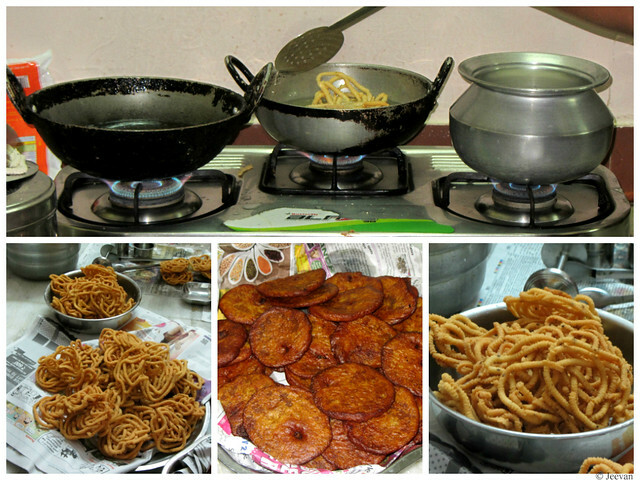 I think people who follow certain customs as Nombu are bound to prepare Athirasam and Murukku but there isn't a restriction to go beyond making varied sweets and snacks. I feel regret now why we shifted our house from the apartment, as I think how wonderful it has been then sharing the festival sweets and snacks with flat neighbours likewise they do. Though we share with a neighbour here, I feel something missing on the festival front and it wwasn'tlively it used to be with kids running around and shouting happy Deepavali in energetic yet sweet voice. It was another wonderful scene to see kids all gather at the entrance of the apartment and enjoy bursting and sharing the firecrackers. Most of the time it’s only the kids bring the Deepavali snacks and greet us in their glorious colourful attires. Deepavali! Spelling the word itself causes some magic and brings enthusiasm. While nearing the festival of lights comes an unexplainable joy and mind began to thinks how to celebrate it efficiently and make memorable. From the childhood days Deepavali has been my favourite festival or I can say season, as we pick up firecrackers less than a month ahead to the festival loosely from the local retail shops. The best Deepavali celebration ever in my life was spent with my late uncle in 1998 and it was a period we were reconstructing our house and temporarily shifted to my grandmother’s place. The celebration was wholesome as we gathered as more than two families, everything was double! My uncle wasn’t an enthusiast of firecrackers, but understanding that we are he bought us enough and also joining in the fun warfare. My father used to bring crackers list from his office when he was in service, where they used to collect fund and make some present for Deepavali and also arrange for firecrackers according to the list we marked on. Unlike my late uncle, the young one was just like us and a decade elder than me has been a prior to us on buying and bursting crackers. He used to buy 10-20,000 walas and make electric throughout the street, however it cause an impression and impact about us it’s definitely a regardless act to make nuisance by creating loud noises. 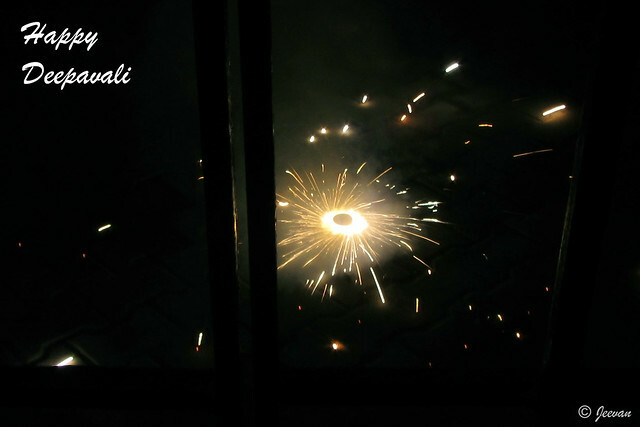 Though things have changed quite later but the first and most fascinating thing that comes to mind (still) about Deepavali is firecrackers. Apart sweet and snacks, new dresses and special program on television, our main intention has been bursting firecrackers. 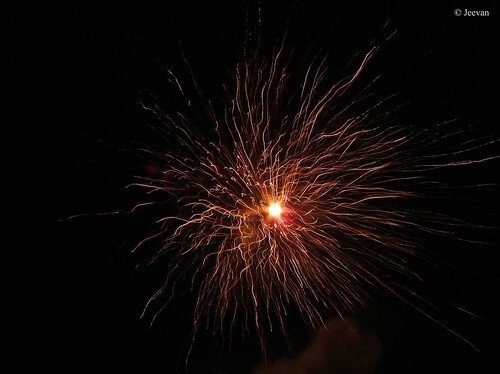 I see the interesting of bursting firecrackers has come down and even I see changes within myself and I have almost lost interest on loud crackers, but the enthusiasm for firework remain. I keep looking out at sky for firework display from the day ahead and followed by Deepavalai, I make venture into the neighbourhood looking for Aerial Outs. Firecrackers aren’t part of our life and we aren't going to burst every day, and it’s indeed against nature and environment but I think they cause festival mood. It’s hard to image a Deepavali without noise though I stopped liking the loud crackers and even the firecracker I used to burst was only crackles or sparkles. This year the noise has come down so much in neighbourhood (for good) and I also began to hate loud crackers as it makes deafening, I haven’t been liked for noise even when I was able to fire crackers. 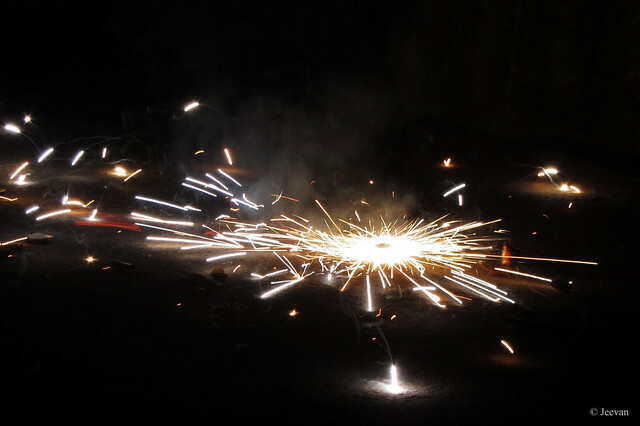 During Deepavali season one could see me then with ears surrounded by black marks (gun powder) as I used to close my ears after igniting firecrackers to ignore sound, so was my favourite one always been the Red Bijli which make less noise among the firecrackers. Only last year I couldn’t celebrate Deepavali not only from firecracker and I also couldn’t go out looking for firework as I was put on cast for femur fracture. I know Deepavali is not only about firecrackers, but we have grown celebrating that way and coming out quite will take some time. As an initial step we can deny quite all noise creating crackers and look for light and colors... according to the meaning of festival of lights, let’s add only colors. I think celebrating a festival couldn’t be anything if we aren’t able to share with others. I see no difference in people from their daily activity to festival day; they just want to be left alone whether watching television or staring Smartphone or computers. People lost interest not only celebrating festivals, but also from variously activities where there energy used to be high and emotionally supportive. I wonder where we are heading without facing each other and sharing the moment, I think even sitting quiet beside will do magic and make sense of sharing. I think the festivals and certain events are made for memorable to think back and cherish about the days being together and had fun. I know priorities change from time to time and it also depend on our need and desire but no where it said that past has to be forgotten or ignored because we have better things to practice. Workaholic and different lifestyle take people far way but things aren’t same in this advanced communication system, but the matter is we don’t have a mind or put thought to share. 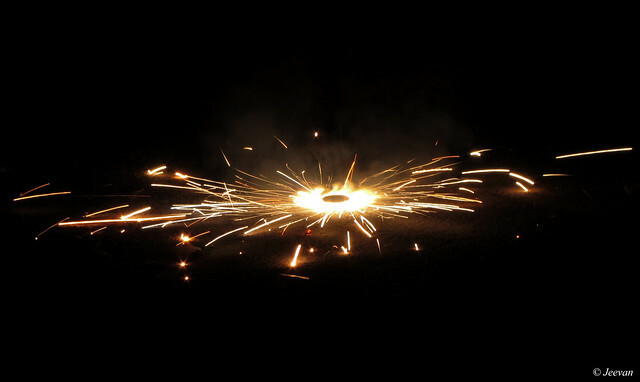 Ground Chakkaras are traditional firecrackers, along with flower pots and sparkles bring smiles. A year completes since I got fracture in my femur, I couldn’t forget the day (17/10/2013) though I wish not to remember the day that was horror. It was also a day that I fell and still unable to stand. I ever thought I would get fracture as I’m out of even normal activity, it taught me a lesson that anything could happen to anybody and I almost come to the term to accept what comes my way. But the only thing that put me into fear was the uncertain nature of a disease or disorder. I had been bedridden for nearly 2 months and the only difficult I experienced physically was way to toilet. Even though I used commode wheelchair, transferring between the bed and chair was painful until the fracture began to mend somewhat. I went to extreme boredom during that phase as I did anything apart watching television and listen to music, mind was quite contrary thinking whether I will recover or not. Even I got immense time for book reading, but I couldn’t concentrate on anything and most of all wasn’t comfort to do things at lying position. Prone to muscular dystrophy I had reason to worry, since it is a case of losing muscle strength there seems less chances of recovery. Even the doctor who treated me had doubt whether the bone will mend? But glad there was positive result within 10 days on cast and at the end of 46 days the bone had healed well. But the real torture or pain began only after out of cast, when I tried to bend the knee that went stiff being on cast. It took more than 3 months to reach certain degree and to feel less pain, I am still unable to bend the knee 100%. I don’t believe it will bend anymore but I am content with how well it has come now. The fracture doesn’t stop here but it also dragged me further into my future where I lose the ability to stand someday. It wouldn’t be a matter of lose or bothered me much if it happened on the usual slow pace, but it’s hard to accept when the ability fall prey in short span. I could see a great difference with my life before and post fracture, because my dependency has rose from single-handedly to double, now, and during my days on cast and until I feel painless on knee I was supported by three people on transfer to change of clothes. I know my future isn’t going to be same rather it would turn more difficult, but I never thought about it seriously and my intention seems to concentrate only on near future and present moment. I have a vision which is to reach as much possible expanding my world and experience live moments with different environment and sharing with people. The fracture has also caused a greater setback on my travelling front and due to lose of standing ability getting in and out of car has become difficult. I am passionate about travelling and exploring places are one of my core intentions of life, and (also like to go off-roading (mild)) makes me believe that real experience comes out of comfort. Hope all is well and I am back with my comfort travelling soon. These days the road travel has become frequent lose of signal i.e. vehicles come to standstill to every drop of red taillights even the traffic signal shows green. Heedless, we hit the GST road that too on the Monday morning hours has become a great setback towards the travel to Thiruvannamalai, which also delayed the progress. But glad it wasn't too late, since parent’s intended to be there before noon so that they don’t need to wait until 4 pm for the Annamalaiyar Temple to be open for worship. It has been a common rule in many big temples to close the corridor from public use between those times. If it was heavy traffic on the GST road (taking nearly an hour to pass the 10 km stretch between Chrompet and Vandalur), the road from Thindivanam to Thiruvannamalai is bad in condition. The road was cut a lot at many places and somewhere it was just single lane due to pending of road widening. The worst thing was there were no caution boards anywhere and the road suddenly goes down rough without a sign. It was so difficult maintaining a comfort ride, though I am a fan of off-roader, this kind of thing intrude when the intention was different. My mother suffered a back pain coming out of this travel, though the road condition isn’t a cause quite but it could be one of the reasons to think. We reached Thiruvannamalai by 12 noon and the Annamalaiyar Temple was opened till 12.30 due to some ritual happening with the pre-Karthigai event. I stayed (as usual) at the car along with my cousin bro, while others went into the temple; it was a hot day and we parked the car at the open parking in front of the temple (from where I shot the temple tower) facing the majestic Raja Gopuram. 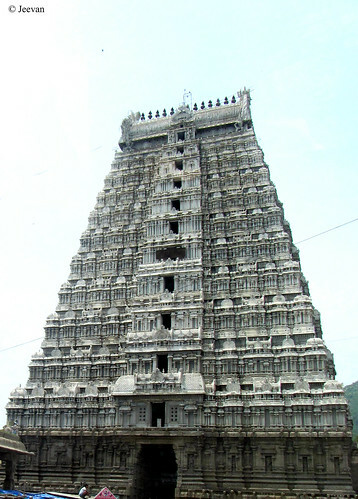 At 217 feet in height with 11 stories, this temple tower is one of the tallest temple towers in India, and it was built by Krishnadevaraya of Vijayanagara Empire. We waited for nearly an hour under the hot sunshine, switching on/off the a/c and watching things happening around. I find a group of 4-5 aged women coming around the parked cars and asking for money, and I noticed that they were doing this like a business. They pick up 5 or 10 ₹ from each and equally share the money, and one of them even asked us for 1 ₹ change so that she could share fairy the amount. Even the one who appointed to collect parking ticket would miss one or two vehicles, but escaping from these ladies seems uneasy and they come blocking the vehicle when it’s suppose to leave. The parents return with cups of Puliyotharai (tamarind rice) from the temple, known that I like it so much and it taste was also really delicious. My aunt had brought lunch for us along with her from home and we bought Pakoda from the bakery and headed to the Girivalam road of Annamalai hill to have lunch. 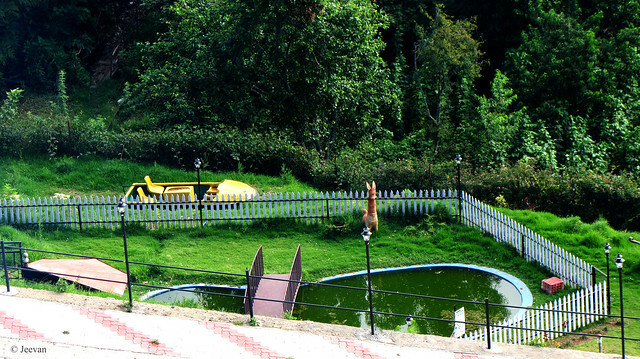 Girivalam is a Tamil word which “giri” refer for hill and “valam” means coming around. Every full moon day people undertake a pilgrim by coming around the hill, which is 14 km in distance by road to come one full round. I like this road for which it travels partially on quiet, calm and green environment and being on this road already once, I couldn't think any other place (or best) to have lunch in a picnic format when questioned where? This road has number of benches to slabs (which are laid for the devotees to take brief rest while on their pilgrim around the hill) on both side of the road which helped us having lunch at comfort seating. 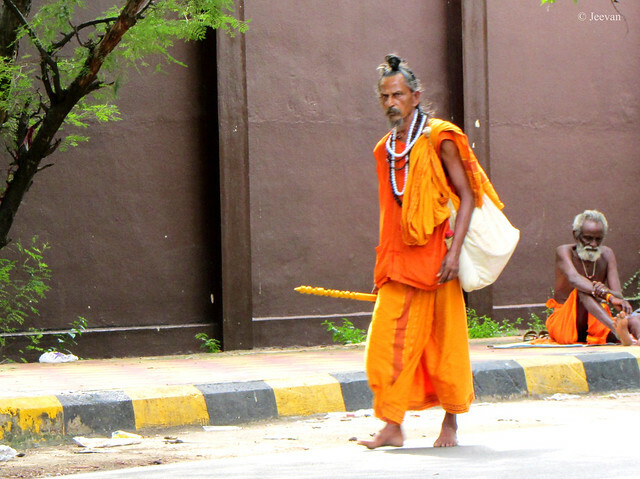 I also saw many Sadhus sitting and sleeping on the pavements along the road, and as we feed couple of Sadhus who were resting and on foot, they blessed and wished us in humble. While retuning on the same route to home, we took diversion at Chengalpattu to avoid the heavy traffic that lagged in morning as we experienced to never turn that side during morning and evening. We always encounter heavy traffic on GST road while coming into Vandalur, and to make it congestion happens the building of Outer Ring Rd. I have crossed Gingee couple of times while heading to Thiruvannamalai, but this time decided to stop at the foothill of Gingee Fort (Queen) on the northern side of the road to take few photos and brief on the area. 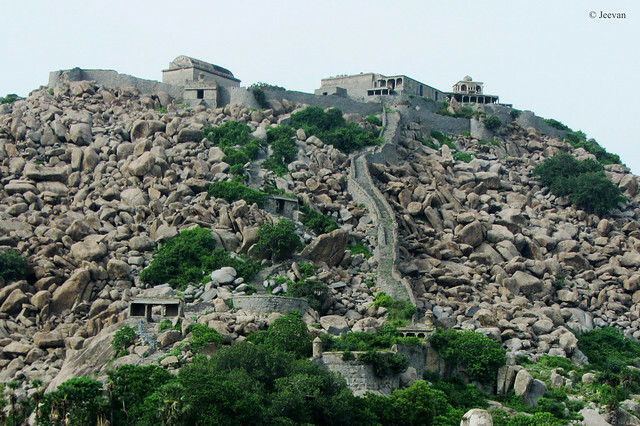 The view from there was beautiful and enrich in green paddy fields and looking up the fort incredibly built on top of boulders hill! The way to the fort hill was inviting with lawn on both sides, but the closed gate doesn't seem to open to me even if I have brought my wheelchair along with this travel. It was disappointing to see that many lakes and pools (along the way) were gone dry without traces of water. The Madurantakam Lake, one of the biggest in Kanchipuram district was quite desert look. But I was so glad to see a new flyover emerged across the railway crossing that connects Chengalpattu with Thirukalukundram and Kalpakkam. It is a very important railway crossing and number of vehicle cross this gate everyday to reach other end towns. We have great experiences waiting at this railway crossing many times while visiting my great aunt who stayed at the suburb of Chengalpattu. Anything they want to buy has to come across the railway crossing after waiting long time for the railway gate to open. The junction that called as Rattinakinarau has been totally different in circumstance now and I could apparently see drastic changes in the landscape on both the sides and new hope (light) sparkling all over. After long time I quite come across the Chengapattu-Thiruporur road with great surprise at the smooth road, which ever seemed to be same. Perhaps first time in the history of the creation of the road that took a new soft surface and wider in space. The Chengapattu-Thiruporur has been a single lane less than 5 years before and only a vehicle could pass at a time and one has to go off-road to give way to another. But now, glowing in surprise, the driving has become quite different on this road and any vehicle could overtake one other such easily and even two petrol bunks has sprout amid the forest and farmlands! 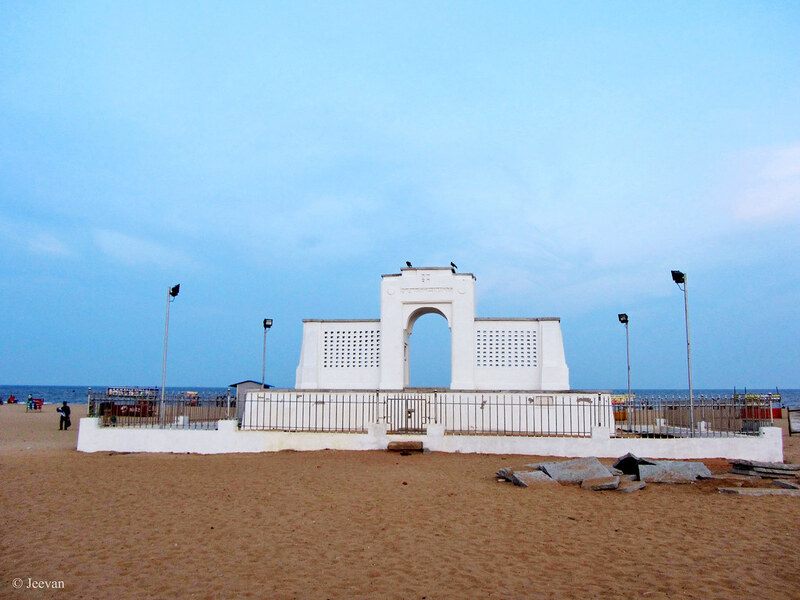 A long time dream had come true by the renovation of Kaj Schmidt Memorial at Elliot’s Beach in Besant Nagar, Chennai. 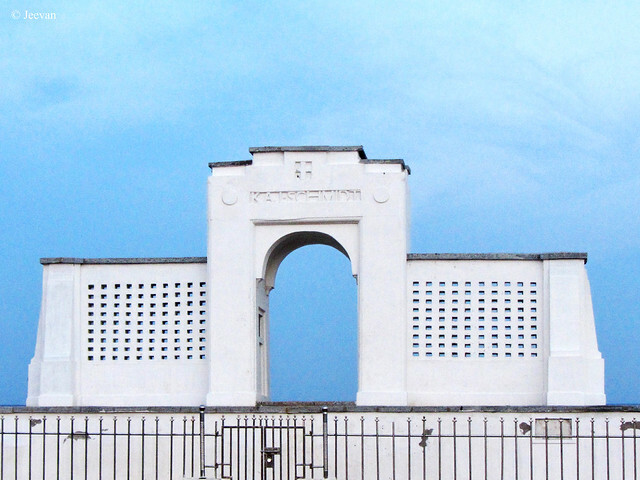 The monument erected in the memory of Kaj Schmidt, a Danish sailor who drowned in attempt to save the lives of three Europeans, which include two woman, has been abandon for long time and a huge crack was suppose to break it apart. But glad the Chennai Corporation had taken steps at last after various attempts by NGOs and public requesting the government to restore the memorial. I had been around the memorial number of times (while I was able to walk), without giving thought what it was and why built there. I also liked climbing upon the memorial through the broken steps and taking seat at the rear front that used to embrace in cool sea breeze. Getting close to the memorial never seems to be graceful unlike watching from distance and catching it during sunrise or sunset is always wonderful sight. 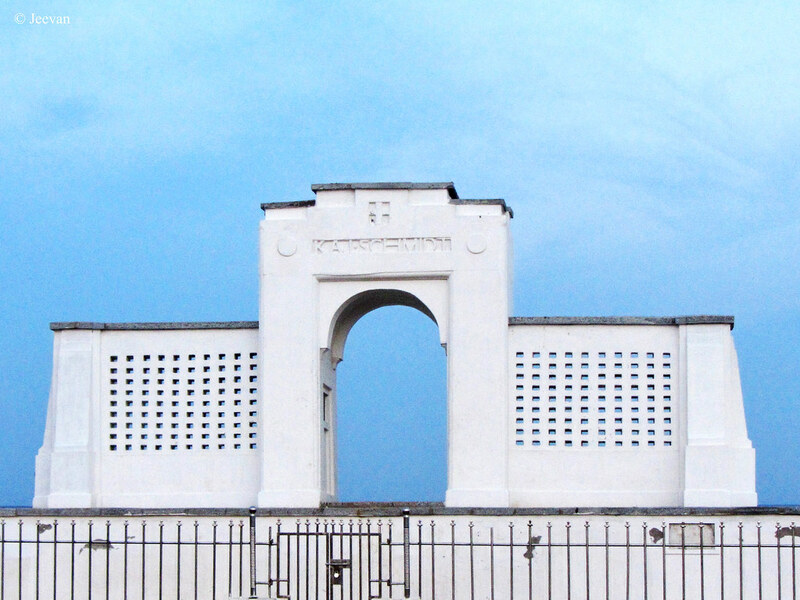 Against the blue sky and sea, the renovated (not yet quiet) white monument beautifies the entire beach site, and it is also protected by fence on four sides. The monument unveiled a year later from his drowning, was built in honoring his dedication and savior attitude towards others. The memorial originally a brick and mortar construction, and colored in Ivory was renovated using lime and stone for the lattice window and sunshades. The monument is stitched with stone to withstand so many years was done by Mamallapuram based sculptor and temple-restoration expert K. Rajendran and his six member team. The building without a stone foundation is now paved in granite sables to enhance the stability and prevent cracks. Anew moon or blood moon... relieved eclipse. 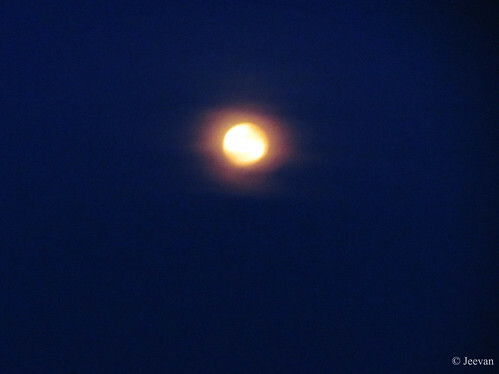 As a light of hope, moon bloomed out of gloom. I was at Elliot’s Beach last evening and quite forget about the eclipse until I find some orange shade on the sky. 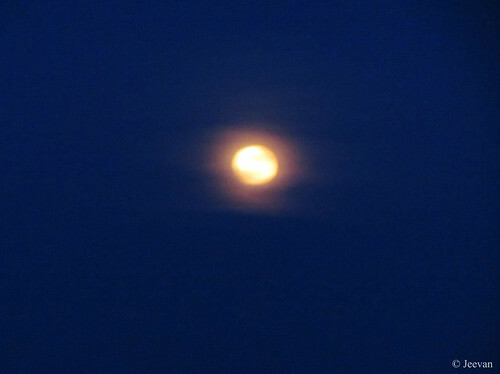 It was surprise to watch the moon unveiling the eclipse against the dark blue sky… though unclear, it was wonderful capturing the moon at it’s glorious. Our pet dog Maya is also quite back to normal and her surgical wound was healed to let restore her enthusiasm. It was really difficult to keep her away from licking or biting the wound, but glad despite denied applying medicine she recovered well. For more than a week she didn’t come out of her favorite hideout (beneath the bureau) and only made quick in and out for bathroom. After every haircut her movements used to be very active and become so hungry to finishing off anything quickly. She perhaps gone though very painful time due to surgery, for her to can’t even stand for a moment and it made us worry but she also makes smile with her every step in forward toward her healing. Now we are happy that we put her into a peaceful journey and trouble free health. My parents had bought a second hand Suzuki Swift car to make my travel easier, since I had trouble climbing into our SUV. The car came with low budget and good in condition don’t want me to miss it, and swift is one of my favorite cars and ride quality is so good and I had couple of travel on ECR before decided on purchase. We have upgraded the tires of the car to big size to add more comfort on any kind of road. I still have to modify the car with turnout seat, while looking for transferring hoist to import from abroad to make further easer and I am also suppose to change or alter my wheelchair to suit for the car and more comfort on sitting. Later I’m experiencing back pain due to long duration sitting on the wheelchair or improper sleeping position… looking forward to a change.